With a belief that structure and physiological function are closely related, Fujiyoshi (the author of this paper) named the field of studies of structure and function of membrane proteins “Structural physiology”. 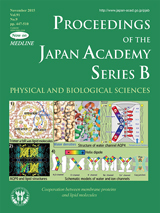 Electron crystallography is especially useful for studying the structural physiology of membrane proteins and Fujiyoshi has been significantly contributing to this field by developing new techniques and by showing that the cooperative function between membrane proteins and lipid molecules are crucial. Examples of such cooperative interactions between membrane proteins and lipid molecules are shown in this cover. 1) Bacteriorhodopsin (bR) pumps one proton by absorbing one photon. Electron crystallographic study of the bR structure in a membrane layer clarified how a proton enters an opening of less than 5 Å in diameter by synchronizing with light absorption by the retinal, which suggests that proton migration on the cytoplasmic surface formed by the bR trimer and lipid molecules effectively induces the pumping function. 2) The eye lens is formed by lens fiber cells and its transparency is achieved by aquaporin-0 (AQP0) and lipid activities by adhering cell membranes narrower than the wave-length of visible light. 3) The structure of aquaporin-4 (AQP4), which is the predominant water channel in the brain. The structure solved by electron crystallography clearly discriminated eight water molecules as shown in the figure, whereas X-ray based imaging showed only blurred densities. In cooperation with the arrangement of carbonyl groups, the strong electrostatic field formed by two short helices in the lipid bilayer allows water to enter through an otherwise highly hydrophobic channel. 4) The importance of the helical dipole moment, which is enforced by cooperation with the lipid bilayer, is evident in water and ion channels. As evidenced by these examples, structural physiology is an important research field for both basic and applied biology, such as drug development.